Part 2: The False Observation Of "Turn-Step-Hit"
Part 3: Thinned and Confused: Tennis Science, Video Analysis. It seems like everywhere you read physics is being invoked to justify one's point of view on how best to hit the ball. In fact individuals with professional doctorates head the various USTA and USPTA Sports/Education Committees, and intellectuals from other fields have been drawn to tennis. The sports science crowd loves to say, "you can't change physics," and teaches you how to play according to science. Educators say, "this is what we know," and analysts say, "we agree to disagree." Everyone has their own line judge with a Ph.D. in biomechanics to make the call on how things work. Nothing against these people, but I thought if evidence one party uses to support one's hypothesis can be contradicted or used to form an alternate hypothesis then intelligent minds would prevail and further work would be noted. But if you have attended a tennis teacher conference you may have witnessed broad dismissives to those in the audience who sincerely see or offer a different interpretation of what is being presented. "Doesn't look that way to me," one tennis teacher clearly said from the back of the small room after the video analyst described the moving parts to Sampras' serve using slow motion video. The speaker ignored him. In the 1926 book, "Mechanics Of The Game," the author clearly shows modern tennis at work - loading, exploding, western grips, wrap around strokes - and in fact was "disillusioned" there was no "stiff wrist" as he assumed "in making the best forehand stroke," a perceived slight on his understanding of the game he made up for by labeling it falsely a "snap" of the wrist. Today's scientists use modern equipment with today's language to sell you on the same "new" technique, but just as yesterday's scientists and observers were incorrect in a lot of their assumptions today's scientists and observers are incorrect as well as shown in Parts 1 and 2 above. Perhaps tennis science really isn't science at all. The Ph.D.s use the right equipment, they have the right education, but maybe there's something about tennis that's not showing up in the science, maybe science is not replicating or looking at the right spots in tennis. Here is one look how scientists set up their experiments and how analysts understand what they see. Judge for yourself. 1. What was that video you supplied them with? [a video was used for instruction] I'd like to get a copy for my own edification. Is your open stance definition facing the net, or something else? A - The video was simply a segment from an instructional video...I can't remember where I got it...and I'm in New York now, so I don't have access to it. We gave them simply general instructions that they should step forward (toward the net) for the closed and their feet should be more parallel to the net during the open stance. 2. There are two types of open stances, one where the weight shift is kept on the back foot during contact, the other where it's kept on the front foot. Which type did you use as your model? A - We didn't care about the weight shift...so we didn't make any statements about it. 3. In the open stance, were the feet allowed to leave the ground, did the subjects switch (their forward/backward) positions of the feet after contact? A - They were allowed to do whatever they wanted in terms of leaving the ground. 4. In either square or open stance, did the subjects move into position to take a step prior to contact or were they standing in-place? A - They were in place, as the ball hit a small carpet each time it bounced on the court, so they knew exactly where it would be. But they still were allowed to step into it. 5. In the square stance, to what object did the front foot step and where was the toe pointed? It is possible had I run this experiment using different types of weight shift from an open stance, moving to the ball prior to the hit, and stepping forward towards the ball instead of towards the net the results would have been the same. What is more relevant, though, is the work-to-results ratio, that is how much work each position requires for the result created, but this was not a goal of this experiment. For this reason alone this experiment is not substantive enough, and when you incorporate it did not understand the open stance that uses the step-and-hit you have to wonder about its authenticity and relevance. A. Power in a tennis serve comes from the contribution of larger muscle groups: torso, hips, shoulders, and arm. B. The wrist "snap" does not contribute to power in a serve. C: Thus there is no wrist snap on a powerful serve. Consider this logic where science proves choice... if you can figure it out. 1. In general the player will feel less shock/jar from ball impact when using a heavier racquet, but this racquet will require more muscle activation to get it up to maximum velocity through the hitting zone. If injuries are felt to be due to shock/jar or twisting due to mis-hitting or poor technique, or due to playing more powerful opponents, then a heavier racquet with a larger head may be preferred. 2. The player will usually generate more power by using a lighter racquet that may take less muscle activation to generate maximum velocity through the hitting zone. If the arm injury is felt to be due repeated use in many matches, then a lighter racquet may be preferred. Frame mass. Modern tennis rackets have been getting lighter and lighter. However, greater racket mass is directly proportional to greater speed on a ball, if all other variables remain equal. The other advantage of a racket with more mass is that this mass helps protect the player's arm by being more resistant to the acceleration of impact. Example—Very light rackets are great for the fast movements of a serve-and-volley player, but provide less protection to the arm during the shock of impact. You might suggest to a player that he or she increase racket mass to help protect the arm or to mechanically discourage a tendency to swing wildly (over hit) at shots. Just how many different types of forehands does Roger Federer hit according to the tennis analysts? Four, five, six? One tennis player analyst on the net claims at least twenty five variations. This analyst say he has different kinds, as in different stances, different footwork combinations, different follow-throughs. Assuming for a moment this opinion is literally correct, how did Federer learn all those different types, and how does he manage all of them? How does he know when to do which one, how is he able to execute type "O" stance with a type "2" footwork combination, type "Ypsilon" shoulder, type "Granada" wrist, type "Gecko" arm flexibility, and type "Deca" follow through? And how does this help you? 1. Looking at a pro's stroke this way is indeed paralysis by analysis. 2. Can't these variations share a common source or do we learn each one individually? As admiration of a pro's talent it's wonderful to read about multiple forehand variations, but how does this help you? I bet you feel you should be able to emulate some of these variations because you're smart and a good tennis player. How, then, by understanding the situations in which they are used? Para-nalysis again. Unfortunately for us the teaching of Federer's truly updated forehand borne from simplicity is being ignored and a "modern forehand" is promoted where the work-to-results ratio is not the same. The "modern forehand" is too convoluted for its own good. What about injury prevention from the overwork it takes to produce results one way versus another? I heard a major teaching organization's head with a Ed.D. say that if the playing pro did everything correctly there would be no injury, to which a touring pro who happened to be in the room piped up about his own hip injury and its relationship to the loading and rotation. The speaker said his form needed adjustment and he needed to strengthen the related musculature. Ah, blame the athlete. In the popular movie "The Karate Kid" a martial arts master is challenged to improve a desperate student's karate. The student wants to learn the complicated hot moves right away but the master instead has him apply "wax-on, wax-off" to his numerous old cars to show him that complexity is borne from simplicity. An artist gave me a similar example from her world, lamenting how today's artists out of art school want to do Picasso's modern art right away. But what they didn't get, the artist told me, was how Picasso was an excellent draftsman for years before he turned the art world on its ear with cubism. Picasso could draw beautiful figures, hands, animals. In other words he learned what is an artist's bread-and-butter before his genius blossomed. So how does Roger Federer manage all those forehands? He doesn't, because it would be impossible. He doesn't manage different types of footwork, different types of follow throughs, different types of body input. By learning only one basic type for each category he is able to organically adjust and adapt to the circumstance without having to think too much about. Thus the different "types" we see in him, and, truth be told, in other playing pros. And the better pros started out with better fundamentals, i.e. step-and-hit. It's that simple. The "modern forehand," a.k.a. "angular hitting style," opines "angular momentum, rather than linear momentum, [is used] to power the shot" and to do this the body movement during the swing is a "drive upward" to unleash the coiled, or loaded, spring-like body that often finishes off the ground with the back foot coming forward. This is advocated by academics in various teaching organizations to achieve greatest racket momentum, power, and this "angular hitting style" is drawn as a direct contrast to what they call the traditional/linear model of "Turn-Step-Hit." Poppycock. Don't be confused or misled, unless you want to look like a frog jumping from one lillypad to another. Tennis pros from yesteryear and today all say moving forward into the ball is the holy grail to tennis. And as today's track athletes do not use a "modern" gait or structure to running tennis players today do not use a "modern" method in their business (the swinging volley perhaps excepted). Move forward into the ball, step and hit. Either area can be tweaked a bit, modified, amplified, each can be broken down into little pieces to both teach it and get more out of each piece. But the overall picture remains the same. If I am going to explode it will be forward into the ball. If forward into the ball my back foot is going to push. If my back foot pushes I am going to need to step-hit. If I am going to step-hit I need to load first. If I load first I need a timing step second. If I need a timing step it should go forward. A quick example follows showing how tennis science doesn't look at the right spots in tennis to justify their beliefs and hypotheses, or doesn't see what's hiding in plain sight. 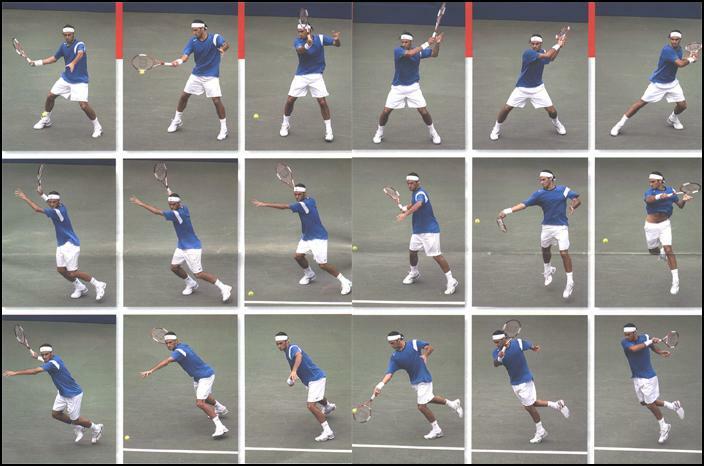 The following is taken from the USTA's own High Performance Coaching Newsletter For Tennis Coaches, and "The Forehand Stance" uses three Federer forehand models (seen before in Revolutionary Tennis) to illustrate differences between the square stance and the modern semi-open and open stance. The article starts off saying each of these three forehands is "situation specific" - a serve return, 2 groundies - and that "both linear and angular momentum are important to all strokes." But then the analysis confuses the reader by saying linear and angular momentum are two mutually exclusive ways to deliver racket head speed, said speed delivered from either linear momentum in the square stance ("transferring weight from back foot to the front foot"), or angular momentum (trunk rotation) from the semi-open and open stances. Doesn't make sense. It is of utmost importance to compare things correctly, fairly, properly. Failure to do so leads to confusion, miscommunication, loss of player participation. We must compare apples to apples, and not apples to walnuts. From the USTA High Performance Newsletter, vol. 6 no 4. 2004. "2. 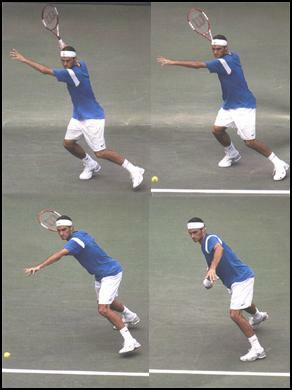 Both linear and angular momentum are important in all strokes"
Part 1 in this paper above clearly shows Federer's semi-open and open stance forehands providing "forward motion of his body's center of mass" and of transferring weight from back foot to front. This meets the USTA's definition of linear momentum and proves he may not rely "heavily on trunk rotation" for racket speed out of these stances. And since the USTA admits research has shown the presence of linear momentum in an open stance ("very little") perhaps science should ask, "How does the body's forward motion affect racket momentum since it's present in every stance? Which stance helps this best? How does the body's forward motion affect the role of the stroke's natural angularity and vice versa?" 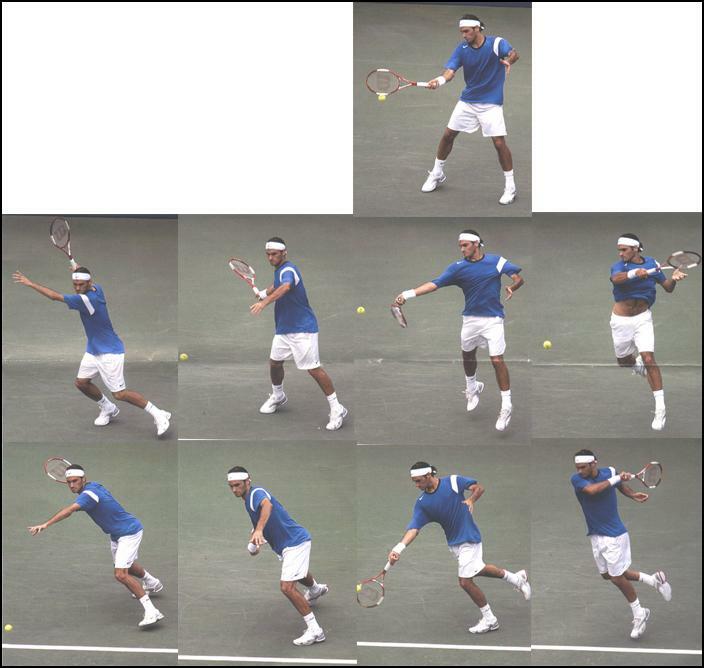 Furthermore the same angularity of heavy trunk rotation the USTA analysis reads into the semi-open and open photos can be seen in Federer's square stance photos as well (later). But first a closer look at their photos regarding linear momentum only from a square stance. The right 4some shows the square stance on the bottom two and semi-open stance on top. The bottom is "pictures 2 and 3" of opinion "linear momentum [being] generated [using the square stance] which then contributes to racquet head speed and the force of Federer's forehand." The top are pictures 2 and 3 from the semi-open stance where the USTA opines "... Federer relies heavily on trunk rotation to generate racquet speed and therefore, these strokes predominantly use angular momentum." Federer in both stances has the front toe off the ground first and in the top semi-open photos he step-hits and his back foot pushes forward into the ball (heel off the ground). To say Federer uses only trunk rotation for racket speed in the semi-open stance here simply overlooks what the feet are doing. Hiding in plain sight with these photos, and seen earlier in Part 1 above, this omission seems to be a choice to satisfy a "modern" forehand hypothesis. The USTA tells us, "linear momentum... [which] then contributes to racquet head speed and the force of Federer's forehand" occurs [only] out of the square stance. But since linear momentum is also seen in Federer's semi-open stance it is reasonable to say linear momentum also contributes there to racket head speed and force. The USTA excludes this hypothesis because it opines, "In the open and semi-open stances (top 2 sequences), Federer relies heavily on trunk rotation to generate racquet speed and therefore, these strokes predominantly use angular momentum." By omission it is being said the square stance does not rely "heavily" on trunk rotation or that it is more pronounced in the semi-open and open stances. A careful look at trunk rotation at similar points does not support this hypothesis. Photos comparing the trunk's rotational angles in all three stances show very little if no difference among them, though of course the lower body is different. Perhaps tennis sports science tries too hard to reflect textbook analysis when explaining how the body works to produce the best tennis strokes. But judge for yourself. First two left: bottom square stance, top semi-open. The angle of the torso, judging the turn of the shoulders by both the white stripe on the front sleeve and the amount of space between the white stripe and the back shoulder indicates an almost identical angle. The difference besides the angle of the hips is Federer is leaning over. Second two left, bottom square, top semi-open, show a highly similar shoulder angle, the differences again being the hips and Federer is leaning over. The angle would be the same were he upright. Third, three photos high, the top open stance is identical to the semi-open beneath and to the square below but for Federer's seesaw tilt (small logo on the right shoulder visible in all). Last two on the right bottom/top are identical, only the turn of lower body in the square stance (bottom) prevents the shirt front rising and the hips from opening more. It is quite clear trunk backward/forward rotation of similar, if not equal value is present in all stances. The trunk turns more from a semi-open or open stance against hips that aren't turned literally sideways, true, but if you were sideways you wouldn't feel compelled to turn that extra amount because you are going to step forward into the ball. Regardless, it is disingenuous to imply trunk rotation is not very much present in the square stance because it is. Would you rather rotate "heavily" with angular momentum for your stroke empowerment and be like Kuerten or Nadal? What is the distinguishing factor here between Federer and his peers? More or less work? More or less forward movement? More or less torso rotation? More or less elegance? The distinguishing factors are less work, more forward movement, less torso over-rotation. Simpler. Cleaner. Elegant. The kinetic link system is a "coordinated sequential movements of the segments of the body to build force from the ground through the hips and trunk to the shoulder and into the arm, hand and racquet." The hypothesis says this force-momentum is transferred up the body and into the racket. This holds neatly and maximally when the arm is raised overhead like on a basketball shot or on a tennis serve as an upward linkage. But when we swing around our body and not either directly overhead or down as in golf how does this force transfer "up" in the same neat and maximum manner? It doesn't. The strongest hits come on serves, not groundstrokes, evidence of when the linkage system is expressed neatly and maximally and when it's not. Swings that happen around the body, as in all racket and stick sports, boxing, martial arts, this same linkage system is not so elegantly expressed. Try as you might it's never just a question of loading and unloading, winding and unwinding. Baseball batters take a short stride forward with the front foot before rotating massively and swinging around the body. The short stride is linear momentum, the weight transfer is athletic rhythm, but scientists say the power delivered by linear momentum is very little when compared to angular momentum from body rotation. Then why take the small step, why not just stand still and bat? Because this small step is the keyhole through which their massive rotation works. Advocating for angular momentum as the main vehicle to deliver the body's kinetic link system looks good in textbooks but in practice, for a tennis player, there's a large "but." Why? "Additionally, due to the reliance of angular momentum in many of the open stance shots, mis-timing the intricate series of segmental rotations can lead to the ineffective power transfer through the kinetic link system resulting in musculoskeletal injury." USTA High Performance Coaching, Vol. 8, No. 2, 2006. Why must there be a "reliance" of angular momentum with its intricate series of segmental rotations? Is there a solution to avoid the "mistiming" that leads to either a weak shot or injury? I don't think baseball says if you mis-time the hit it results in injury, they just say you blow it. The point is we shouldn't rely either solely or materially on angular momentum, there is a preceding element: linear momentum, moving forward into the shot. Long axis rotation of the entire arm so that the elbow points towards the path of the hit ball." Curiously the "trunk rotation around the back leg" means using the back leg and hip as the axis of rotation, instead of using an axis through the center of the body. On the one hand they claim this rotation is part of the kinetic link and how-to of the modern forehand, and yet they also claim in another High Performance newsletter, "However, even when performed properly, the loading of the dominant side hip is an inherent characteristic of the open stance forehand and must be considered when preventing and/or treating injuries in the lower body." The full scope of the USTA talking out of the other side of its mouth can be seen in the rebuttal section Head-On. Tennis is a different game. Textbook description of the body's linkage system in generating momentum only goes so far. While we "can't change physics" we can change how physics explains what we do. Here's to tennis scientists explaining how and why forward movement is associated with the best tennis, how linear momentum is the structure through which Federer produces his "beautiful flow". Perhaps it's time for research scientists to begin with tennis instead of science when trying to prove the mechanics of our game. I'm sure physics professors cringe at how fast and loose tennis is with linear and angular momentum. What about conservation of momentum, how does this fit into our picture? Perhaps this conservation of momentum is made simpler by moving forward into the ball as opposed to standing with a wide base and trunk rotation around the back leg? Move Forward Into The Ball. There's a lot more to it than meets the scientist's eye. and check 'em out for yourself in depth.